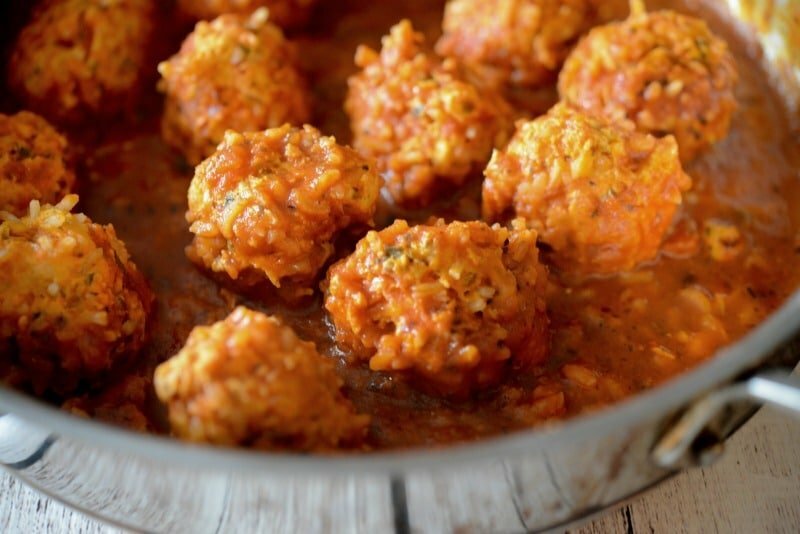 Chicken & Rice Meatballs made with ground chicken, fresh herbs and long grain rice cooked in a tomato sauce is a healthy dinner alternative with robust flavor. I mentioned the other day that my father in-law gave me a bunch of old cookbooks and in one of those books, I found a recipe for porcupine meatballs; which are meatballs made with ground beef or poultry with rice cooked in a sauce. When the rice cooks, it pokes out of the meatball resembling porcupine quills. Though I did understand how they got their name, it just seemed like an odd thing to call food. I got visions in my head about of eating some type of wild animal meat. I guess that’s just me, which is why when I decided to make them myself, I called them what they are, Chicken & Rice Meatballs. 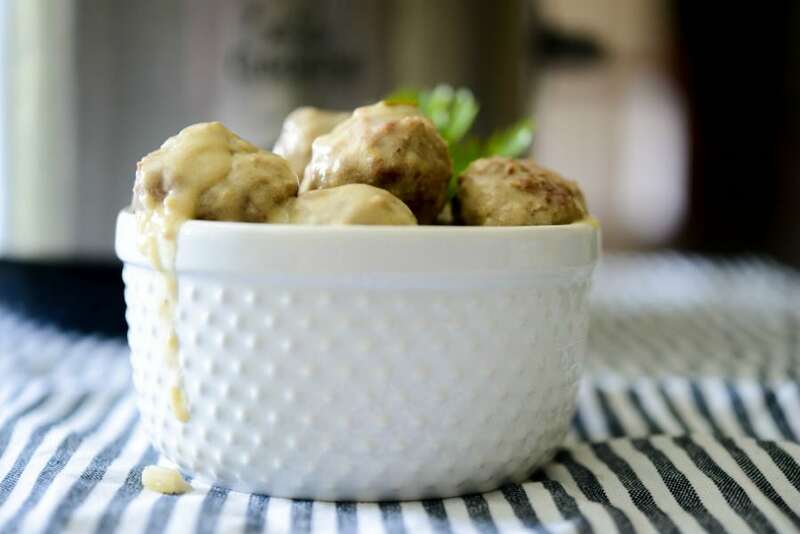 What I loved about this recipe is that it’s made in one pan on top of the stove, is ready in about 45 minutes and if you want you could also cook them in a slow cooker once the meatballs are browned. 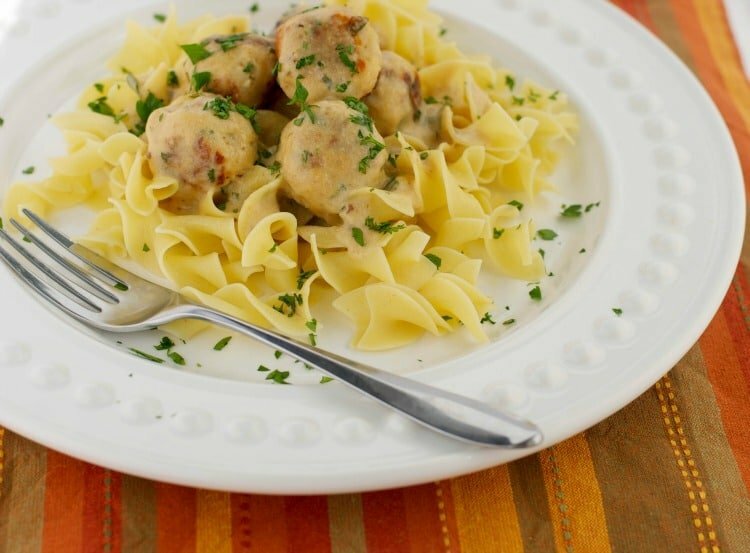 They’re also low in calories and fat; which makes these Chicken & Rice Meatballs a tasty healthy weeknight dinner option. 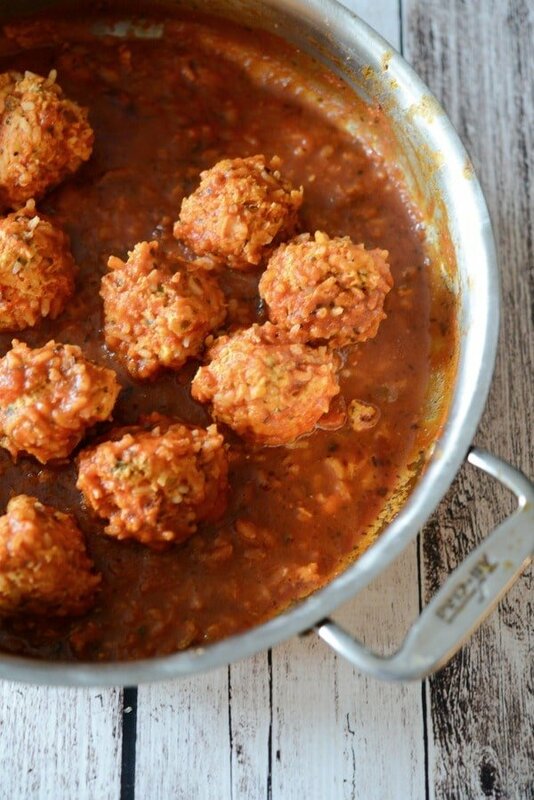 To make these meatballs you’ll need ground chicken (you can substitute ground turkey, beef or pork), scallions, fresh oregano and rosemary, uncooked long grain rice (I used white, but you can use brown rice), extra virgin olive oil, your favorite tomato sauce and water. 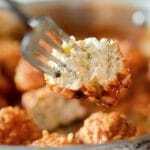 Start by mixing the ground chicken, scallions, herbs and rice in a bowl until all of the ingredients are combined; then shape into 2-inch meatballs. The mixture will be a bit sticky but will hold their shape once you start frying them. Next, heat a little extra virgin olive oil in a large skillet and cook the meatballs until they’re brown on all sides or approximately 5 minutes; then add the sauce and water; then mix well. Cover the skillet with a lid, lower the heat and simmer the meatballs for 30 minutes until the meatballs and rice are cooked (the rice will be sticking out of the meatballs). Check halfway through cooking to ensure that the liquid has not completely evaporated; which may happen if your heat is too high. If so, add a bit more sauce and/or water. 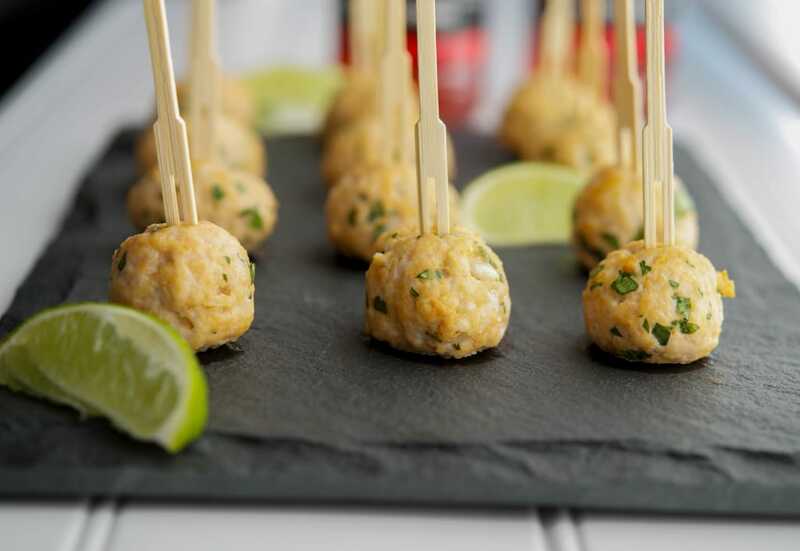 This recipe for Chicken & Rice Meatballs served 4 people (3 meatballs each). I served this for dinner with steamed broccoli and my family really liked them. 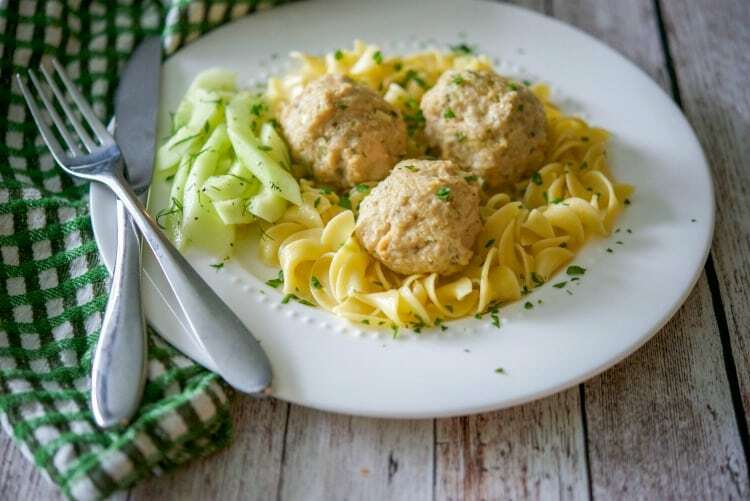 Each meatball is only 55 calories and has 3 grams of fat (165 calories and 9g fat per serving) so not only are these meatballs delicious, they’re a healthier dinner option. 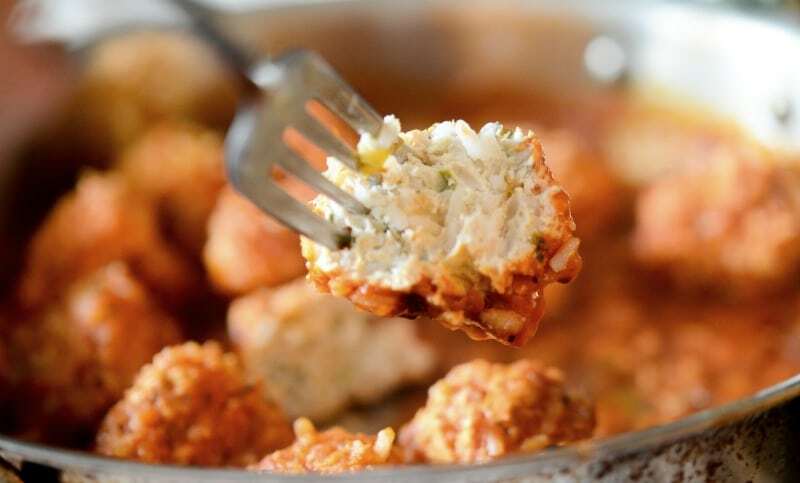 Since you could also keep them in the crockpot, they’d also make a great addition to game day snacking too. ~Enjoy! Next, heat a little extra virgin olive oil in a large skillet and cook the meatballs until they're brown on all sides or approximately 5 minutes; then add the sauce and water and mix. Cover the skillet with a lid, lower the heat and simmer the meatballs for 30 minutes until the meatballs and rice are cooked (the rice will be sticking out of the meatballs). Check halfway through cooking to ensure that the liquid has not completely evaporated; which may happen if your heat is too high. If so, add a bit more sauce and/or water. *Ground turkey, beef or pork can be substituted for the chicken. *Crockpot Instructions: Brown the meatballs as directed; then place them in your crockpot with the sauce and water. Cook on low or high for 1-2 hours; then change setting to warm until you're ready to eat.